We've talked plenty of times about what a complete joke the USTR's Special 301 report is. It's supposedly a "listing" of "naughty" countries who don't protect intellectual property enough for the US's tastes. However, as we've noted, there is no methodology behind it: a bunch of industry lobbyists submit lists of what countries they don't like to the USTR, the USTR talks to various diplomats, basically rewrites the list to "shame" certain countries, and releases the list. Canada, which has been put on the list for years despite having stricter copyright laws than the US, has officially stated that it simply does not accept the Special 301 findings as legitimate. Chile did the same thing a year ago. As I've mentioned before, at a conference a few years ago, I even saw the then head of the US Copyright Office mock the Special 301 report as a widely recognized joke. Unfortunately, however, for countries who are heavily reliant on good relations with the United States, being on "the naughty" list is often an effective way to force them to jump through hoops to make Big Pharma or Hollywood happy. As we've discussed, Spain has been pressured into changing its copyright laws via the 301 list multiple times. George Washington PhD student Gabriel Michael has decided to dig deep into the Special 301 Report and its history to determine if there's any point to it at all, and his initial results suggest that the process is even more of a joke than initially suspected. He notes that there's no real "enforcement" mechanism (at least not one that the US seems willing to use). He also notes that the US is incredibly hypocritical about it. While the Special 301 report mostly complains that other countries don't have enough intellectual property protection, at other times it goes the other way, like when it's the kind of IP that the US government doesn't like (geographical indicators or GI). ...by any reasonably objective standard, the European Union offers very high levels of IP protection. Yet as recently as 2006, Special 301 listed the European Union on its watch list, citing “concerns” about the EU’s geographical indication (GI) regime. Given that GIs are a form of intellectual property, USTR essentially placed the EU on its watch list for offering too much IP—or, if you prefer, the wrong kind of IP. Interestingly, this is a tacit admission by the U.S. that at least some kinds of IP can act as trade barriers. In researching the effectiveness of the Special 301, Michael notes that supporters of the effort point to a study done in the International Trade Journal called "Special 301 and Royalty Receipts from U.S. Trade Partners" by David Riker, which argued that the Special 301 is effective, because there's a pretty big increase ($5.4 billion annually) in US royalty receipts from countries after being placed on the list. Michael sets out to replicate Riker's results and discovers very, very different results, in part because Riker made some notable errors (claiming Hong Kong was on the priority list, when it wasn't). Riker also only looked at some of the countries in the Special 301 Report. Michael looked at what happened when you viewed all of them, and he also had two more years of data to research. In the end, Michael finds that Riker's conclusions are simply not supported by the data. To summarize, while I was able to replicate Riker’s results, simply including additional years of data causes his findings of significance to disappear. Likewise, even in his original dataset and models, if Watch List designations are included, the findings of significance disappear. Ultimately, these results lead me to conclude that Riker’s 2012 article is both theoretically and empirically flawed. 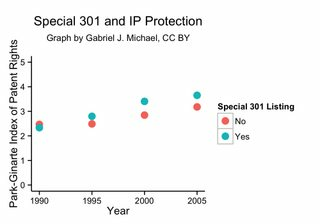 It cannot support the conclusion that Special 301 designations are correlated with increased IP royalties from designated countries in subsequent years. In another post, Michael points out the obvious: the Special 301 list is never actually about intellectual property protections, but about political considerations. He notes that countries that are considered to have stronger IP protection (using the Park-Ginarte Index) are often listed on the Special 301 Report, while others with less protection are not. He even looks at the average of countries on the list and off, and finds that those on the list have higher protection than those off the list: Given that, Michael looked at the leaked Wikileaks State Department cables, where there are a bunch discussing the Special 301, and quickly notes that it's pretty clear that political considerations were much more important than actual concerns about intellectual property conditions. In short, the Special 301 is just a way to diplomatically slap a country with whom we're having other political issues, in order to give the US leverage on some political point. He quotes State Department cables concerning Taiwan, Saudi Arabia, Bolivia and Norway showing how it's much more about politics. At some point, it needs to be asked why we have the Special 301 setup at all. It seems designed mainly to piss off other countries, while making Hollywood and Big Pharma feel good. It doesn't seem to do anything beneficial at all. The U.S. Government, the Obama Administration, has made the USTR Special 301 Report a complete joke. It's no longer taken seriously because of how copyright, patent and intellectual property holders has simply bought and paid for every elected official to push countries onto that list. If the international community were smart, they would develop their own Special 301 list and place the United States at the top of that list because America is the America offender of intellectual copyright violations. Why yes, of course. The USTR Special 301 Report was not a big joke before the Obama administration took over and made a mess of things - amirite? I mean the whole thing was so peachy for decades that its recent demise is catastrophic. The report used to be taken seriously by all countries which resulted in no trade disputes, but now everything is all messed up. Thanks Obama! Well if you think about it the report was a joke before Obama. The only difference now is that Obama made it even more transparently clear that it's a joke. So Obama did make a change in favor of transparency like he promised, he made it more transparently clear that monied interests dictate government. I bet that was his plan all along! We should recodify the "USTR Special 301 Report" to a more appropriate name, like "Inverse corruption index by the USA". Please be aware that there is no such country as European Union. The EU is a loose alliance of european countries with diverse laws and regulations. I hear that Tom is making a sequel to the minority report, Special 301 Report. This one is a comedy. It is not a comedy. It is more of an action-drama. It involves a police force that can see when someone is going to commit copyright infringement BEFORE they actually do it. They send out homeland security in SWAT gear and armored vehicles and stop the pirate before they manage to cause any harm. However, things go terribly wrong and our hero joins a cult and becomes more and more crazy. There is a heart-wrenching scene with him jumping up and down on a couch that will make anyone tear up. I don't want to give away the ending, but it's the internet's fault. China could call their report, Special 401. Brazil could name theirs, Special 1337. Russia should probably name their Special report 1962, after the Cuban Missile Crisis. Then all the diplomats could run around inside the WTO headquarters and slap their Special reports in each others faces. Seriously though, there has to be a reason foreign countries care about USTR reports. They either want US investment in their country, or they want to sell their low priced goods in US markets. I don't understand why Spain is so concerned. I can't think of anything I've purchased from Spain, in the US. I'm sure Spain buys all their clothing and electronics from China. Gets most of their oil from Russia and Saudi Arabia, just like the rest of the world. The only thing the US really has to offer is food exports. I guess Spain buys a lot of food from the US. I know Spain can't be interested in our overpriced Western medicines, because those come with all kinds of side-effects that are usually more deadly than the symptoms they're supposed to be treating. Techdirt should start a special report about how stupid special reports are. I think the issue with spain is a) fishing rights and b) imports (some food, some lumber, some other natural resources). Plus, at this point, Spain doesn't have much to lose by implementing the US recommendations, and it gives them political brownie points with the US. > I don't understand why Spain is so concerned. I was hoping for a link to the list in question. It would be handy to have. Re: Link to the list? Re: Re: Link to the list? Thanks! That's a lot of boring text to slog through to extract a list of countries. Also, which is "naughtier," the Priority Watch List or the Watch List? Has someone out there made a brief "at-a-glance" list? Re: Re: Re: Link to the list? The people glancing at briefs are naughtier. The list of nations is in the table of contents (starting at page 4 of the PDF), so you don't actually have to read the document. The "priority" watch list is naughtier, but I'm not clear on what, specifically, the difference between the two lists is. The Priority Watch List is the naughtier one, though the naughtiest happens to the Priority Foreign Country (which is actually a misnomer!). There are all kinds of "bad boy" lists floating around. Countries with human rights abuses. Countries that support terrorism. etc., etc. At least the Special 301 list tends to be more 'politically neutral' than something like the US's "State Sponsors of Terrorism" list, in which the biggest culprits always seem to remain conspicuously absent. Like the gangs of terrorists taking over (US ally) Iraq right now, beheading people by the truckload and all kinds of nasty things ... so where did their support come from? "Move along, nothing to see here." Let them keep pushing out the list, what needs to happen, is that more countries need to see being on the list not as something to be ashamed of, but as something to be proud of. Being on the 'Naughty' list for US companies like that should be a badge of honor, something a country can show off, to show that they aren't willing to bow down to US corporate demands. If more countries started treating it like it should be, everyone would be much better off. This is actually the US Mercantilism Special Interest Wishlist. The idea is to "shame" other countries for their trade barriers (like declaration needs or environmental concerns or the geographical indicators mentioned), and for not implementing the trade barriers in the interest of US mercantilists.